An activist from the climate change campaign group Extinction Rebellion has superglued herself to the gates of Buckingham Palace. Jenny Shearer, an activist taking part in the protest in London on Saturday, glued herself to the entrance after previously blocking a road by Parliament Square, according to a live stream on Extinction Rebellion’s Facebook. In the video, the host describes how a “comrade” spray painted the pavement outside Buckingham Palace, but breaks off mid-sentence when someone points out Ms Shearer is glued to the gates. “I literally held Jenny’s bag earlier… she’s been arrested several times. She’d been chained to the outside of Parliament Square shutting down the roads for hours,” says the host. The moment Ms Shearer makes the glue-based statement can be seen in the video around the 28 minute mark. A press release from the campaign group, which aims to raise awareness of climate change and pressure the government into “reversing policies inconsistent with addressing climate change”, said 14 people were willingly arrested for criminal damage on Saturday. Extinction Rebellion said around 2,000 people had gathered outside Buckingham Palace. 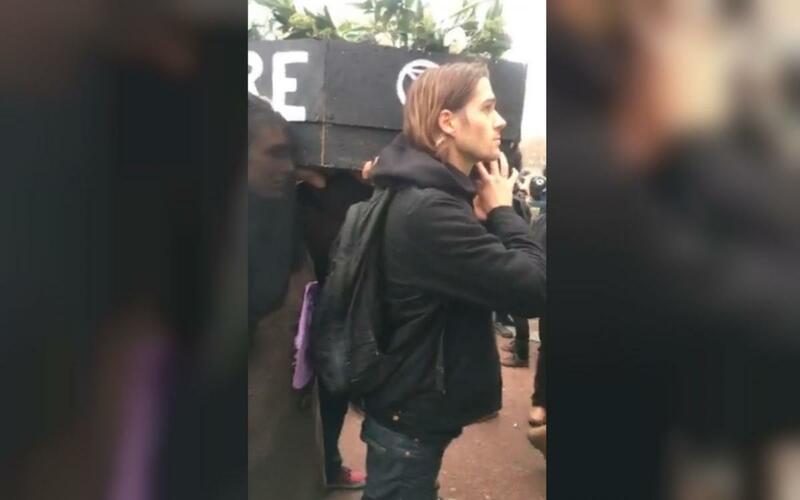 The protest began on Saturday morning, where activists gathered at Parliament Square and held a ‘memorial’ - complete with a coffin - to commemorate the species lost to extinction. Earlier in November, Extinction Rebellion activists glued their hands to the glass doors of the Department for Business, Energy and Industrial Strategy. Earlier in the week, Dr Larch Maxey, a member of the group, joined James Whale on talkRADIO. Whale challenged him, saying: "There is really nothing you can do to stop climate change." "I hope you're wrong - the UN Secretary General said it's the defining issue of our time and the IPCC [Intergovernmental Panel on Climate Change] said we've got 12 years to sort it out," Dr Maxey replied. "Between them, we know we've got 18 months and 12 years."